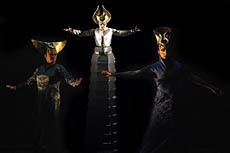 Dance in the footsteps of the Pharaohs: Akhenaten (Echnaton) is the third portrait opera by the American composer Philip Glass. 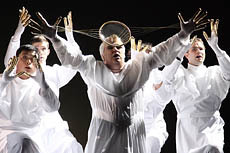 The opera, set in the 14th century BC, illuminates the life and reign of the visionary ruler. Choreographer Nanine Linning brings the densely atmospheric musical landscapes to life in a "dance concert". 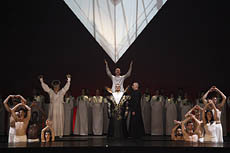 Choir, soloists and Dance Company Nanine Linning join in a dynamic choreography where dance, singing, orchestra, video projections and stage design merge into a work of art - the first Heidelberg "Dance Opera". Theater & Orchester Heidelberg in collaboration with Dance Company Nanine Linning, Heidelberg 2014. Costume design / photography: Georg Meyer-Wiel.